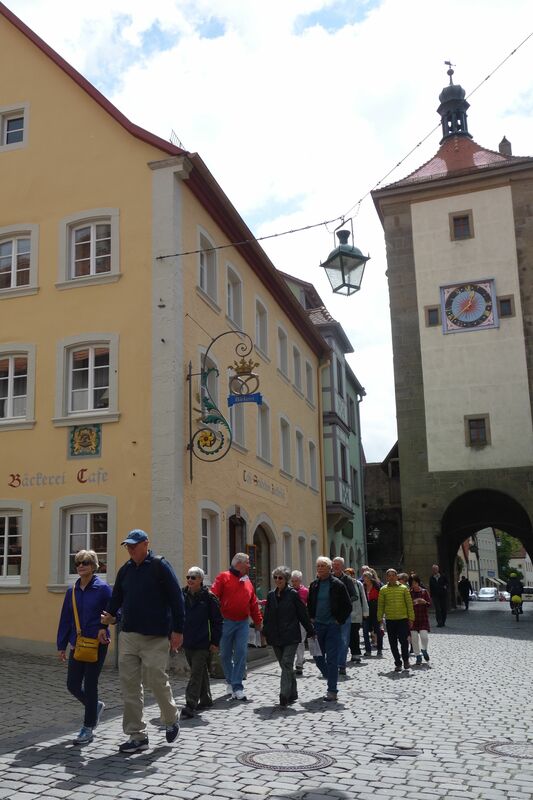 Stroll through Rothenburg early enough to beat the crowds. Walking through Rothenburg in the middle of the day is a bit like slipping through a time-tunnel back to Medieval Germany. Its pastel half-timbered façades, pointy spires, delightful fountains, and small-town charm enchant visitors and make us all forget we have to share the cobbled streets with a swarm of crowds. And while you might feel like you’ve walked onto the set of a Walt Disney film, this town’s preserved-for-centuries appeal is the real deal. It’s because it was forgotten for so long that it survives today as it did hundreds of years ago. The town flourished through the middle ages–for five centuries a crossroads of European commerce, ideas, and information. But with the 30 Years War in the 17th century (the fight between Catholics and Protestants), the wealthy city was suddenly a poverty stricken backwater. It was so poor, it was literally stuck in the past. Nothing new was built, nothing changed, and this former powerhouse became a veritable cocoon. Time marched on without Rothenburg. Rothenburg remains mostly as it was 500 years ago and is practically tourist free in the upper part of town. In the 19th-century, writers, artists and musicians uninspired by the Industrial Age, needed inspiration. They found it in time-passed places like Rothenburg. Through their writings, paintings, and music, they inspired wealthy Europeans to travel here on their Grand Tours of Europe. And the Rothenburg we know today–that place of half-timbered German dreams–was re-born. Ironically, the town’s poverty led to a new affluence as tourism breathed life into the once depressed place. People told their friends and families to come here. And they told their friends and families. And people came. 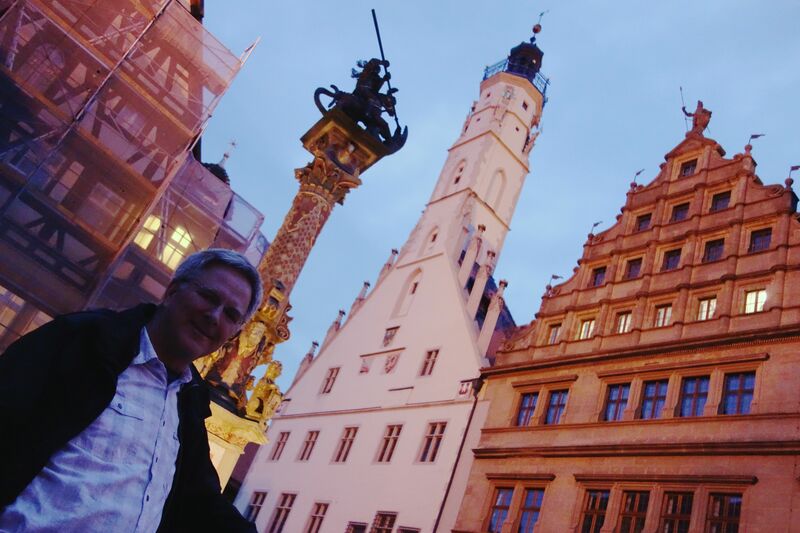 Even Rick gets charmed by Rothenburg. This 16th-century door was the inspiration for the cover of his first edition of Europe Through the Back Door. 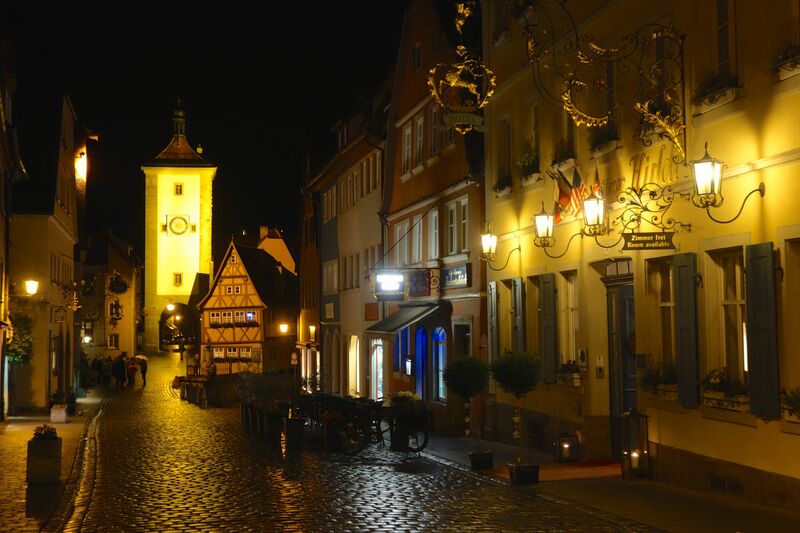 The spell of romantic Rothenburg spread even to people who had never been there. One mother shared glowing memories of her visit in the late 1800s to Rothenburg with her son. Mementos from her trip hung on the wall. She firmly etched her love of the town in her son’s mind. And although he had never been there himself, he knew it intimately from the stories told to him by his mother. Knowing the historic and cultural significance of Rothenburg from his mother’s descriptions, John J. McCloy (U.S. Assistant Secretary of War during World War II) became a pivotal figure in the town’s survival. Rather than bomb the town to destroy the Nazis that were holed up behind the town’s fortified walls, McCloy sent orders to not use artillery to take the town. Instead, he was instrumental in negotiating the Nazi troop’s surrender and saving the town from utter destruction. Thanks to him, we get to be tourists here today. 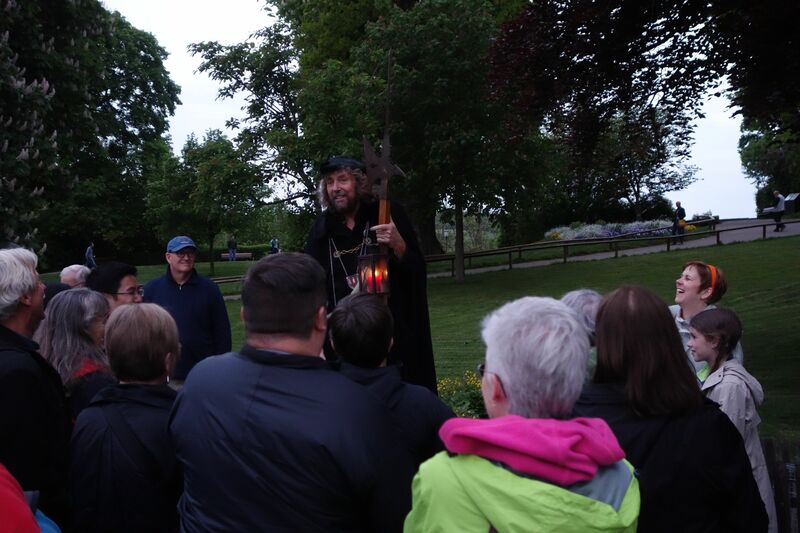 Like eager children following the Pied Piper, visitors go wherever the Night Watchman leads. In the evening, Rick and I join about 80 other people (practically the only tourists who aren’t day-tripping but rather staying overnight in this town) for an “intimate” stroll with the Night Watchman. Decked out in a heavy black cloak and wielding his intimidating axe-like hellebard, his in-case-of-emergency horn, and hisiconic lantern, he shares tales of what it was like to be a medieval night watchman–the third lowest person in society, behind the executioner and the undertaker. The Night Watchman charms everyone with his stories. Riveted by his medieval stories of siege, tidbits about architectural features, and compelling details about WWII, we cling to his every word. He has a strangely unmelodic yet whimsical voice. He bellows his tales slowly, clearly, with just a tinge of a German accent, and his precise comedic timing throws us into fits of laughter. He’s been doing this every night for years, but it still feels fresh and unjaded. 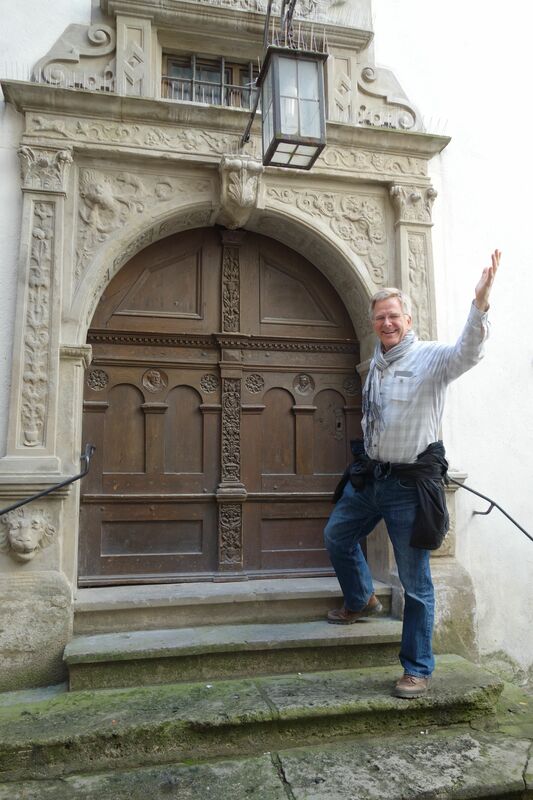 He’s the most famous citizen of Rothenburg, but it doesn’t seem to go to his head. We know a great place you should visit, and it’s called Rothenburg. While his walking tour is peppered with historical facts, the experience is more entertainment than a history lesson. But it doesn’t matter. 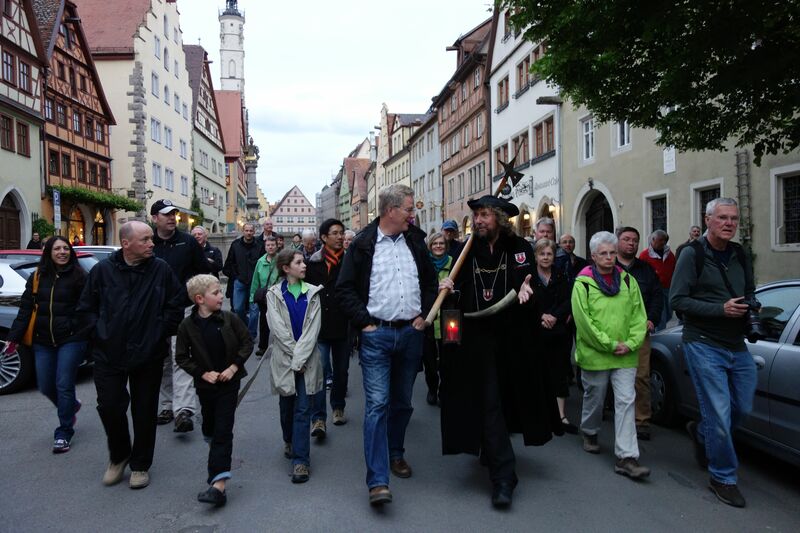 Like those 19th-century writers that inspired so many travelers, the Night Watchman is getting people interested in this well-preserved and charming town of Rothenburg, so that, hopefully, they’ll tell their friends and families…and perhaps they’ll come visit, too. In the evening, you have Rothenburg all to yourself. Glad to see the night watchman is still there. That was the highlight to our trip with our adult kids back in 2006. The town is charming and worth staying a couple of night to have the town to yourself! I agree; I wish we had had one more night there. And this time, I actually bit the bullet and bought one of the Night Watchman’s DVDs, so Rick and I can watch it at our leisure. I had the pleasure of visiting Rothenberg for the day many many years ago. It is definitely a place that is timeless and classy! Next time I must plan to stay overnight like you did! Thanks for bringing back the fond memories! Hi, Virginia. We really enjoyed staying at Hotel Gerberhaus. Cozy rooms, very friendly staff, and a stellar breakfast. I’m sure the next time you’re in Rothenburg, it will still be as timeless and classy as you remember. I enjoyed reading your post. I have been to many places in Germany (LOVE Germany), but not Rothenburg. I especially enjoyed learning about John J. McCloy. I am looking forward to visiting. Thank you! Hi, Kim! Add it to your list if you get the chance. It adds a whole other unique dimension to traveling in Germany. Thanks for reading the posts! 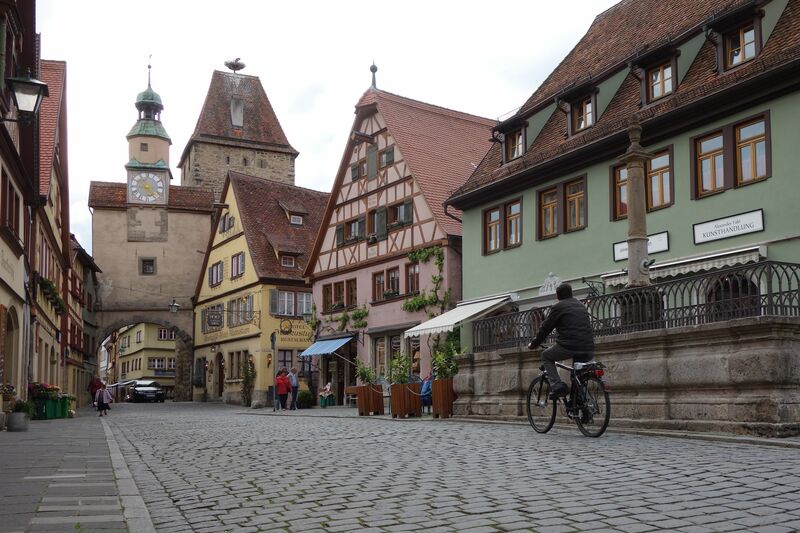 Rothenburg is one of our “home away from home” places in Europe. We never miss the English Conversation Club meetings on Wednesday night and if it works out right in our schedule the peach gelato at d’Estep. Having been traveling here staying at Rick Steves recommendations since 2003. Thanks for the great picture and posting. Love the Night Watchman’s tour! We always have a drink at an outdoor café and watch him do the tours followed like the Pied Piper of Hamlin! We do miss the Favetta family running the Goldenen Rose in Rothenburg. Another Rick Steves treasure. Hi, Paula! The English Conversation Club meeting is definitely on my list of things to do, but I never seem to be there on a Wednesday. I’m glad you’ve enjoyed your frequent visits to Rothenburg! You write so well. Reading your blog is second only to real travelling. Wow! Thanks, Luke! I really appreciate the support.